As the HANA database is installed; this license key is installed automatically. Only for ninety days, these keys are valid and permanent license keys should be requested from SAP marketplace. The intake of HANA system beats the memory license amount when unenforced license key is installed; however, the SAP HANA operation does not get affected in this case. In case of enforced license key, if after installing it, the intake of HANA system beats memory the license amount then the HANA system gets locked. 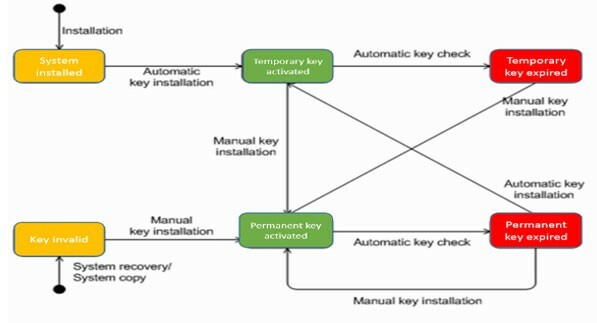 In such circumstances, HANA system needs to be resumed and an innovative license key is requested and installed. System privileges are used to authorize users to perform administrative actions such as managing licenses. Depending on the landscape of the system different License scenarios can be used in HANA system and all of them are not based on memory of HANA system installation. SAP NetWeaver Business Warehouse, SAP HANA Stand-alone, SAP Business Suite, SAP HANA Cloud are some examples. License properties of HANA can be checked easily just by clicking on HANA system and then on properties and license. One can get details about License type, Memory Allocation Start Date and Expiration Date, and the information that is vital to request a new license through SAP Market Place. Even one can delete the license key just by choosing the delete license key option. If the permanent license keys are removed this may result in the database to get locked out. To unlock the database the fresh, effective permanent license key is vital to be installed. In addition, the database cannot be backed up in lockdown mode. Thus, it can be concluded by stating that to use SAP HANA Database, license keys are very required which can be installed easily.